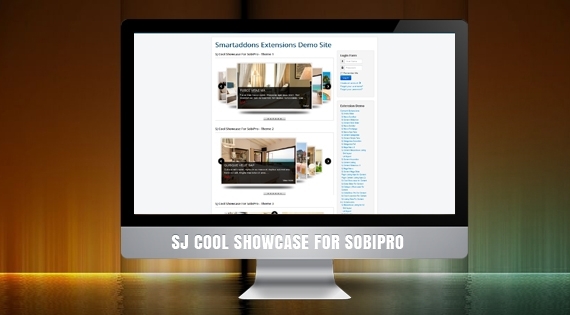 SJ Cool Showcase for SobiPro is a great choice for frontpage of websites such as business, technology, news, selling-product websites and etc, with wonderful sliding effects, high quality, large images and should be placed at highlighted position of website (Homepage) to attract a considerable number of audiences. At first sight, with clean and clear layout structure, auto/clicked slide effects integration and specific price, title & brief item description, SJ Cool Showcase for SobiPro helps viewers catch the quick overview of entries within it. Integrated buttons or direction navigation bar also play role in making a professional slideshow as well as the outlook of website. Go deeper inside Admin Panel, you can find it easy to edit the width or height of module, show or hide Title, description, price, social buttons of each item and handle other parameters. You can also add more effects we provide to make your website more charming, modern and trendy. Now, click View Demo button to see how it really works!